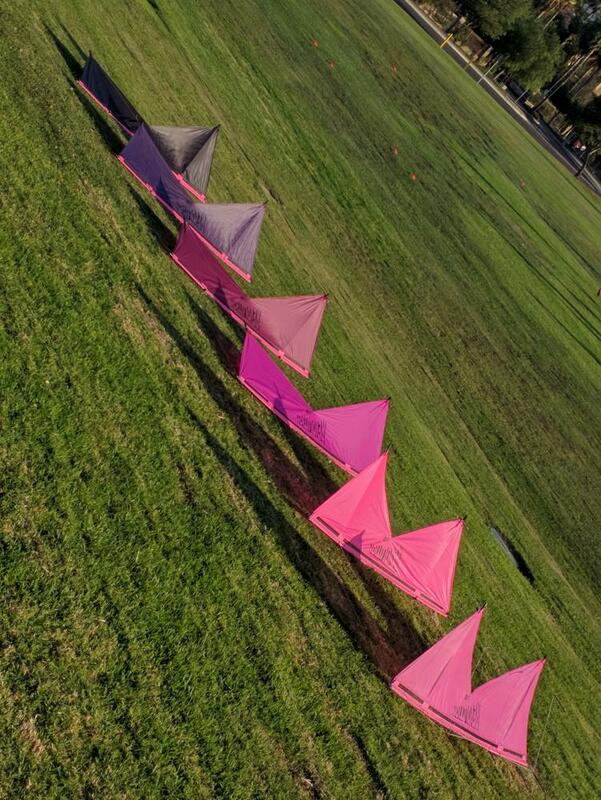 So i have a custom set of 7 rev ii kites stacked all of them have pink leading edge the stack goes from light pink to black all solid color kites are in a custom bag . Does anyone have any interest there are 7 in the stack . Will post pictures later . how much is your asking price ? This session was a work out. Most of the time it was from the low wind requiring work to keep the stack in the air, but now and then there was some "traction action". For this session it would have been an advantage if the frames were a bit lighter. The double tails (Prism 23m/75ft tube tails) looked great when flying straight forward or when making a wide turns. Tight loops however caused the tail on the inner side to stand still. My latest project is my first stack. Yes, I probably should start with something smaller, but too much pull has not been a problem so far with these kites. I've had much respect for the wind when using the Fazer XXL (or rather when choosing to use it or not) which has resulted in much physical exercise when keeping it in the air. Slightly remarkable IMO is the opinion of my mother in law: "The green kite looks better than the blue one". I've been flying the Fazer XXL in spite of its look. I have also ever heard that it ever looks good from anyone anywhere any time. 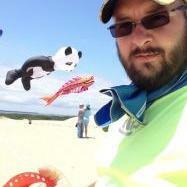 However I've gradually gotten used to its appearance, but can't say it is one of my better looking kites. My plan for the stack is to fit two Prism 75 feet black and white tube tails to each of the XXL wingtips and possibly a 1m line laundry rotor (will slow down too much?) to to the XL spine. 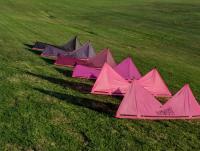 I learnt about stacking from: http://kitelife.com/forum/topic/6478-setting-up-a-stack/, Prism stacking instructions and Highflykites > Kite manuals > Stunt kite manual (part 2) > Stacking stuntkites. I added pig tail like connectors on the first kite (XL) to be able to connect the kites quickly and to trim the angle of the last kite. I use a Liros 200daN/kg (440lbs) bridle line (Dyneema with a polyester sheath). It is about 2mm in diameter and roughly matches the bridle diameter (strength?) of the smaller first kite (Fazer XL). I don't know when I'll be able to test the stack. The size should make the wind range narrower. 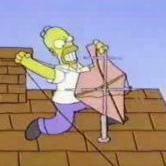 The upper is of course how much sail you can manage in high wind. The lower limit I expect to be fixed, possibly increased a bit due to complexity and that I'm not being used to stacks. And besides, vacation is over and it's back to work now. Another thing that might limit future kiting sessions is my quest during the last three months to reduce the number of: "I always wanted to but I never did"s. I've devoted much spare time to kiting during this period when doing so, which starts to be somewhat less popular with my family. However during this time I have (or started to): learnt to fly two DLKs, experimented with multi kite handles, built the kite bag transport armor, got started with quads, experimented with patching full vent into a mid vent and a standard, gotten hold of a sewing machine (and made a small bag just to learn the sewing machine basics) and now I've finished (but not tested/trimmed) my first stack. Before that it was piloting DLKs "only" and made occasional repairs. Kiting is currently somewhat with the sense of being a Jack of all trades but master of none. Perhaps it is time to instead focus on depth on what I've started rather than covering new areas of kiting for a while. I recently acquired a stack of TRLBY kites that needs a little bit of work. I'm sure much of it is fine, but I'd like to take this opportunity to learn more about stacks anyways so I have a handful of questions to the experienced flyers of stacks. What kind of line should I use to make link-lines? Dacron? What kind of knots (and configuration) should I use for the lines? Clips or not? The TRLBY setup typically uses these paper clip type things to attach the bridle to the spars. Should those be used in stacking setups, or should I make little leaders that I larkshead lines to? What is easiest if I want to be able to change the stack size and/or fly the kite as a single quickly/easily? What weight of line for link-lines for various stack sizes/wind conditions? How long should the link lines be for TRLBY stacks? I've read 18". Anything special about length of the first/last set of link lines? Are all others equal? I think I read somewhere that you want to do something special with the link lines for the last kite, but I don't remember if it was longer altogether, or just one that points the kite a little differently than the rest of the stack. Any good links (preferably with pictures) of a "phantom" and how it works for larger stacks? How large of a stack can I fly without worrying about one? Should I have stronger lines at different points of the stack? I.e. 250# closest the lines, working down to 100# closest to the kite line? I actually have stacking lines that came with the kites, but they're pretty uneven, some had knots pull out, and they use the TRLBY clips, but many are rusty. Does anybody know where to get the paper-clip looking clips, as well as the little key-ring type clips used on TRLBY kites in bulk to make link lines? Hey Y'all, it's time to let some go. We have twins due in September and not enough house for them and all my hobbies. I guess I'll give priority to the babies. Anyhow, these look like the ones that don't make the cut. HQ DeltaHawk, I've not flown this DeltaHawk yet. I was planning on stacking it with the other, but it never happened. No lines. $20 shipped with anything from above. Non-Smoking home, prices include CONUS shipping. I can take further pictures of anything that you are interested in and may even have time tonight to spread out them out. The sails on my Trlby 4 stack have finally reached retirement age. I have plenty of ripstop but I need a pattern for the Trlby sails and I have not been able to get a hold of a ripstop Trlby to copy. In my travels I have collected 8 more frames, including 3 heavy duty main spars. Today, I found 8 more singles online and bought em immediately. I should have everything needed for a 20 kite Trlby stack! I know this thing is going to be under some heavy duty stress so any help on what gauge the kite to kite links should be would be awesome. I have a belt rig made by Kiteman Jack for running big stacks so I just wanna make sure the kite setup is beefy enough. I hope to post updates when I start making the sails.